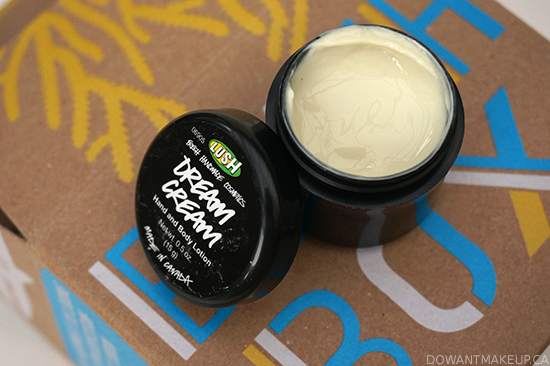 Dream Cream ($26.95 CAD / 240g) comes in a small 15g jar, a perfect size for sampling. Intended to soothe and hydrate hands and body, this lotion is super buttery and rich; just touching it feels luxurious. My eternally-dry cuticles drank this up right away, and I was pleasantly surprised that despite its rich texture, it absorbed well and didn't feel greasy. It's chock-full of some majorly moisturizing ingredients, like extra virgin olive oil, cocoa butter, and glycerin, and has a lovely heady floral scent from rose and lavender. At $26.95, it might seem like a bit of a splurge, but if your skin is very sensitive or irritated (or if you just want something luxurious), it could be well worth it. I've always loved the way LUSH's bar soap looked--like pieces of art, what with all the pretty colours and textures. (No photo, by the way, because I got too impatient to try it and now it's not very photogenic anymore D:) I continually avoided buying because it seemed kinda splurge-y, but I finally got to try one with Sea Vegetable ($7.95 CAD / 100g). 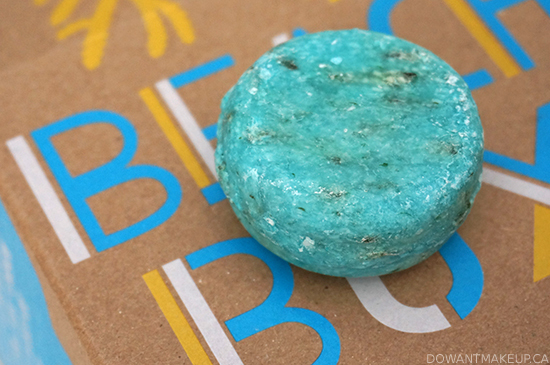 This bright teal bar has a refreshing-yet-calming lime and lavender scent that I wish could stay with me all day. Sea Vegetable is supposed to feature "a crust of stimulating sea salt" for a good scrub, but I didn't notice much salt in my particular bar. There are, however, large strands of seaweed running through my bar that became raised after a few uses; these have a pleasant massaging feeling when I use my soap now. Another bonus is the high coconut oil content, which leaves my skin feeling hydrated and not stripped the way other bar soaps might (and for this reason, I hear it also makes a good shaving bar.) If I was feeling fancy, I would repurchase. Seanik ($11.95 CAD / 55g) promises to volumize hair and add shine with its sea salt content, and nourish and soften with seaweed, but sadly I didn't see these effects on my hair. I really love the idea of LUSH's solid shampoo bars (it avoids all the wasteful plastic packaging of traditional shampoo and is fantastic for travelling) but this one left my hair too squeaky clean and looking a little dried out. As with its box-mates, I do love the scent though--oceanic and floral with mimosa and jasmine. I might give this one a try again with my Dove conditioner, which I've found hydrating enough to counter the drying effects of the Soak and Float shampoo bar. Sea Spray ($12.95 CAD / 100mL) is touted as hairspray/texturizer/perfume, and it's a tricky one for me because basically I am clueless about hair things. I didn't really understand what a texturizing spray does or why I would want one until I tried Sea Spray. My hair is extremely super fine, so much so that when I touch it, it's almost like nothing is there. But after spritzing and scrunching in some Sea Spray on my dry hair, it actually feels like it has some substance, you know? That's the best way I can describe it. I use a light hand since things can get gunky-looking quickly on fine hair like mine (especially on my bangs). 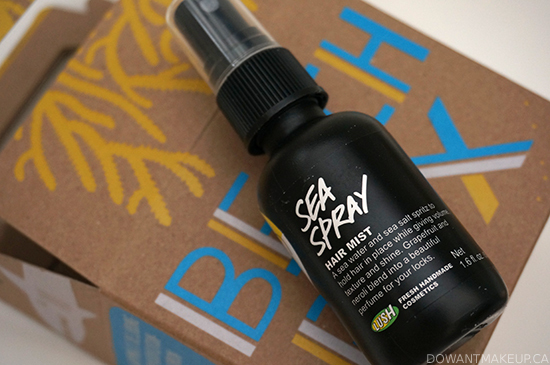 I know I've said it for everything in this box, but Sea Spray smells really, really good. It's my favourite scent in the whole box. The neroli and orange flower fragrance makes for a really refreshing floral and smells amazing. I'd spritz this on my wrists and neck if, you know, it didn't leave salt all over me. Definitely repurchase so at least my hair can look and smell awesome. 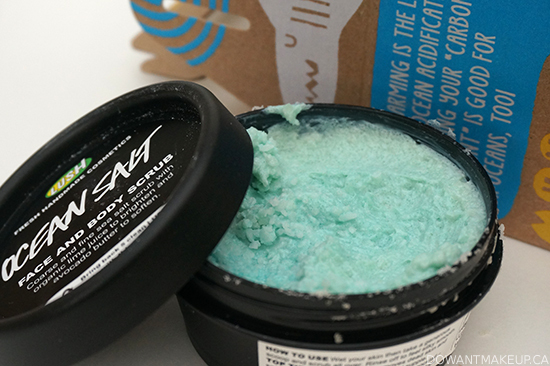 All in all, LUSH has put together a set of products that will leave you smelling and feeling gorgeous long after the tide's gone out. 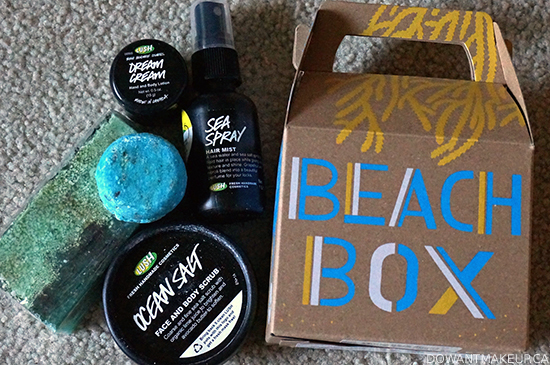 Beach Box's goodies are the perfect sizes to try for the first time, so call up your closest LUSH and get yours ASAP! Which of these five have you tried/are most curious to try?